Bernie Ecclestone has denied extending the deadline by which time Donington chief executive Simon Gillett must be able to demonstrate he has the required funding to host the 2010 British GP. The F1 supremo claims that the additional two weeks 'breather' is merely a legal obligation in view of the fact that Gillett is in breach of his contract. "We haven't decided to give Gillett another deadline at all," Ecclestone told the Telegraph. "We have informed him he is in breach of contract. The contract which we have gives him 14 days to remedy the breach. Most business contracts are like that." Asked if Gillett's claim that he has been given a further two weeks is disingenuous, Ecclestone said: "People interpret things the way they want to interpret them. It would be hard if you were standing in a court today arguing what he said was wrong. But he hasn't been given another deadline at all. He has been given, like the contract says, another two weeks to remedy the breach. No deadline has changed." With Damon Hill and (Silverstone owners) the BRDC finally in a position to play hardball - assuming Ecclestone really cares whether Britain remains on the World Championship calendar - the F1 supremo was asked if he truly believes Gillett can deliver. "I've been thinking he's going to come through all the way along because he's sort of led me to believe it's all OK," he said. "But I have no reason to discuss anything with him. He's either going to remedy the breach or he isn't. If he isn't then that's the end of the story. If he is then we're going to have to make sure that he does all the other things that the contract provides for." While many, including Pitpass, have been highly sceptical of the Donington deal since it was first announced, in terms of Gillett, Ecclestone would have found out pretty much all he needed to know in the story we ran in May, the guy has history. Then again, are we to believe that Ecclestone is the sort to go into any deal - especially one involving such a high profile event - without knowing all the facts. 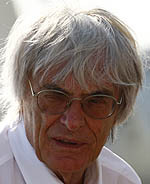 Ecclestone to sue over Donington? End of the road for Donington? Three final races of 2009 cancelled as Button secures title!! !